Following up next are our usual ATTO read and write tests. 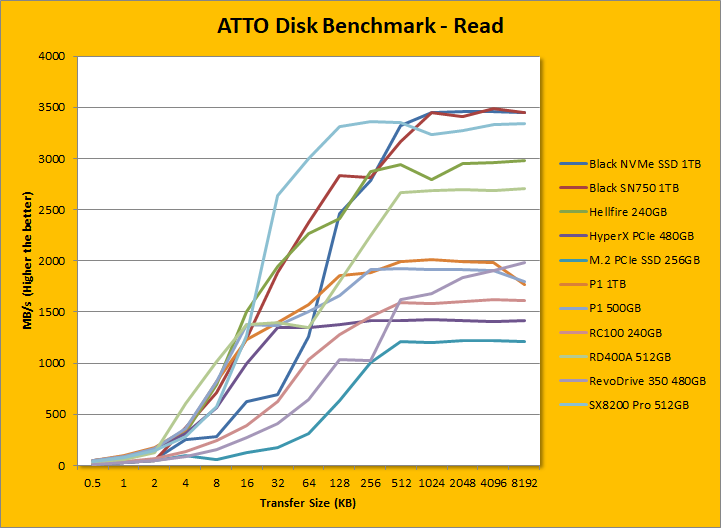 ATTO is an often-quoted benchmark, because it is easy to use and accurate. For the most part, it is a favorite among reviewers, and I have grown to embrace it as much as the next for the last little while. ATTO uses easily compressible data, so compression-heavy controllers will perform very well here; as far as the Silicon Motion controller is concerned -- well, here are our results. As manufacturer peak read and write performance ratings can usually be achieved using ATTO besides Crystal Disk Mark, whether a drive lives up to its marketing claims or not can be validated by this program. ADATA claims the XPG SX8200 Pro 512GB's maximum read and maximum write are pinned at 3500MB/s and 2300MB/s, respectively. According to our tests, these numbers were close. It peaked at 3338.749MB/s read and 2356.994MB/s write. Under the curve, its write speed was comparable to the Hellfire M.2 until 16K, where it was only passed by the pair of Western Digital Blacks. We can see a similar pattern as we move into the read graph, except the Hellfire held on until 16K. 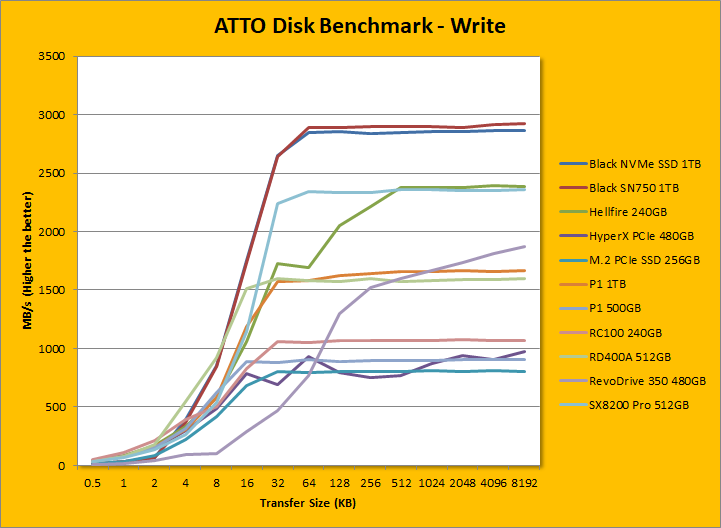 Between 32K and 512K, the ADATA XPG SX8200 Pro 512GB was the fastest SSD in ATTO we have ever tested here at APH Networks. The lead was not given up until 1024K and above. posted 3 hours and 51 minutes ago, with 1 posts. posted 3 hours and 51 minutes ago, with 2 posts. posted 3 hours and 52 minutes ago, with 8 posts. posted 3 hours and 52 minutes ago, with 7 posts. posted 3 hours and 56 minutes ago, with 15 posts. posted 3 hours and 56 minutes ago, with 59 posts. posted 3 hours and 56 minutes ago, with 14 posts. posted 3 hours and 57 minutes ago, with 11 posts.